For the Rockies and Cubs, 162 games boiled down to one game — and then one more game. 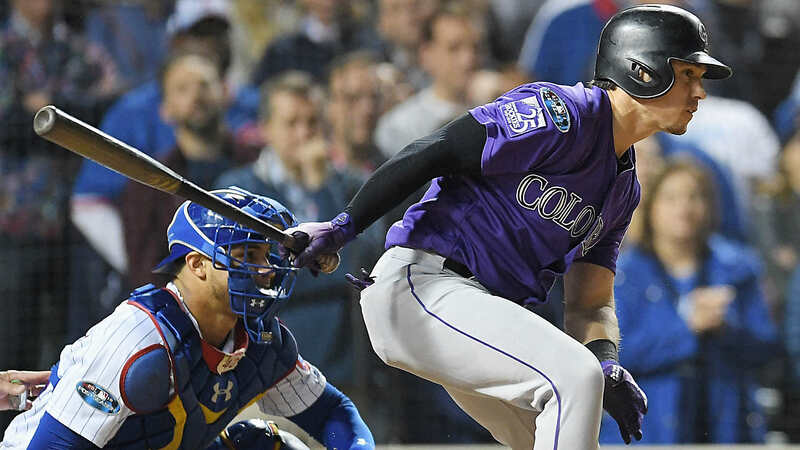 The Cubs and Rockies were handed losses in Monday’s division tiebreaker games, with the Brewers and Dodgers going on to win the NL Central and NL West, respectively. Ultimately, Colorado handed Chicago one more L, this time for good. The Rockies head to Milwaukee following a dramatic 2-1, 13-inning victory over the Cubs in the NL wild-card game at Wrigley Field. Rockies backup-backup catcher Tony Wolters — .170 average in the regular season, by the way — singled home the eventual game-winning run in this memorable marathon. What better way to ring in October? The Cubs sent Jon Lester to the hill in his third career winner-take-all game, with his third team (Red Sox, A’s, Cubs). Lester turned in a great performance, but Rockies starter Kyle Freeland matched him pitch for pitch. After 4 hours and 55 minutes, the Rockies bounced the Cubbies from the dance. The Rox head to Miller Park in Milwaukee, where they’ll face the top-seeded Brewers beginning Thursday. The Cubs get to go home and enjoy pumpkin spice lattes while watching October baseball. 1:06 a.m.: End of game: Albert Almora goes down swinging. The Rockies are heading to Milwaukee for the NLDS. 1:04 a.m.: This is it. The Cubs are down to their final out of the 2018 season after Oberg gets Baez swinging. Albert Almora up. 1:02 a.m.: Well, after a mixup where Gore was ruled to have been hit by a pitch — he wasn’t — he strikes out. Rockies are two outs away. 12:59 a.m.: Scott Oberg stays in to pitch the 13th for the Rockies and hopefully, for them, close out the game. 12:55 a.m.: David Dahl strikes out. The Rockies will look to hang onto their 2-1 lead in the bottom of the 13th. 12:49 a.m.: ROCKIES SCORING PLAY. Three two-out singles and the Rockies take a 2-1 lead. Wolters singles and Story scores. Jorge De La Rosa will come in to pitch for Chicago. 12:48 a.m.: Gerardo Parra singles and Story goes to third. There are two outs, runners at the corners, and Tony Wolters is at the plate. 12:45 a.m.: With two outs in the 13th, Trevor Story singles up the middle. 12:39 a.m.: End of the 12th inning. Kris Bryant goes down looking. The Rockies and Cubs remain tied 1-1. 12:34 a.m.: Rusin retired the first two batters and now the Rockies are making a pitching change. Scott Oberg will take over. 12:28 a.m.: Kyle Hendricks retires the two batters he faces. We head to the Cubs’ half of the 12th, still tied 1-1. 12:24 a.m.: Wilson gets the lefty to ground out and Kyle Hendricks will take over. 12:22 a.m.: Justin Wilson is on to pitch the 12th. 12:16 a.m.: End of the 11th inning. Chris Rusin is taking the mound to pitch to Victor Caratini. Caratini grounds out to end the inning. 12:06 a.m.: The Rockies intentionally walk Daniel Murphy. There are runners on first and second with one out. 12:03 a.m.: Javier Baez draws a walk to start the inning. 12:00 a.m.: Ian Desmond is safe on a fielder’s choice and the Rockies load the bases, but David Dahl grounds out and their half of the 11th is over. 11:57 p.m.: Cole Hamels walks Parra on a full count. There are runners on first and second with two outs. Ian Desmond is at the plate. 11:52 p.m.: Nolan Arenado hits a leadoff single against Hamels. Trevor Story flies out on the first pitch he sees. 11:47 p.m.: End of the 10th inning. Oh sits the Cubs down in order. We are headed to the 11th inning tied 1-1. 11:42 p.m.: Seung-Hwan Oh is on the mound in the bottom of the 10th for the Rockies. He retires Zobrist, the first batter he faces. 11:40 p.m.: Cole Hamels strikes out DJ LeMahieu to end the Rockies’ half of the 10th. 11:36 p.m.: Carlos Gonzalez singles to left and Butera pops out. Pat Valaika will come in to pinch-hit for Wade Davis. He strikes out. 11:32 p.m.: Cole Hamels is on the bump for the Cubs, making his second career relief appearance. 11:30 p.m.: End of the ninth inning. Kyle Schwarber strikes out and Jason Heyward grounds out to send this game into extras. What a way to start the #postseason . 11:25 p.m.: Wade Davis walks Willson Contreras. Kyle Schwarber is in to pinch-hit for Strop. 11:17 p.m.: Pedro Strop strikes out Ian Desmond to sit down the Rockies. The Cubs are coming up in their half of the ninth. Will they walk it off? 11:12 p.m.: The go-ahead run is aboard as Trevor Story singles to left. 11:10 p.m.: Pedro Strop is in to pitch the ninth inning for the Cubs and strikes out Nolan Arenado to start things off. 11:06 p.m.: End of the eighth inning. Almora strikes out. The Rockies and Cubs are tied 1-1 heading into the ninth inning. 11:01 p.m.: Former Cubs closer Wade Davis comes in to face Almora. 10:59 p.m.: CUBS SCORING PLAY. There is life at Wrigley Field. Javier Baez doubles, Terrance Gore scores. The Cubs are on the board and this game is tied 1-1. 10:56 p.m.: Anthony Rizzo rips a base hit into center with two outs. Terrance Gore comes in to pinch-run for him. 10:47 p.m.: The call on the field stands. The Cubs turn a double play and we are heading to the bottom of the eighth. 10:45 p.m.: Blackmon flies out to left. Steve Cishek comes in to face DJ LeMahieu. 10:42 p.m.: Randy Rosario walks Drew Butera to start the inning. 10:38 p.m.: There are some defensive changes for the Cubs. Kris Bryant is playing third base, Ben Zobrist is in left field, Jason Heyward is staying in and playing right field and rookie Randy Rosario is in to pitch. 10:35 p.m.: End of the seventh inning. He struck him out! Adam Ottavino gets out of a bases-loaded jam. The Rockies take their 1-0 lead into the eighth. 10:32 p.m.: Tommy La Stella heads to first on catcher’s interference. The bases are loaded. Jason Heyward comes in to pinch-hit for Chavez. 10:29 p.m.: Willson Contreras walks and Tommy La Stella is in to pinch-hit for David Bote. 10:27 p.m.: Adam Ottavino throws a wild pitch that gets by Drew Butera and Almora advances. The tying run is on second with Willson Contreras at the plate. 10:24 p.m.: Kyle Freeland’s night is done after 6 2/3 scoreless innings. The Rockies will make a double-switch. Drew Butera will come in to catch, Adam Ottavino replaces Freeland on the mound.
. @KFREE_21 with quite the debut. ? 10:19 p.m.: Albert Almora Jr. singles to center in the bottom of the seventh. 10:13 p.m.: Jesse Chavez gets Chris Iannetta to flyout. 10:10 p.m.: Ian Desmond singles to center. David Dahl flies out to Kris Bryant and Bryant throws Desmond out trying to advance to second. Two outs. 10:05 p.m.: End of the sixth inning. Kris Bryant singles to right, Ian Happ moves to second. Anthony Rizzo grounds into a double play. Inning over. Rockies lead 1-0. 10:03 p.m.: Gerardo Parra comes in to replace Matt Holliday. 10 p.m.: Jon Lester’s night is done. He will be replaced by Jesse Chavez. Ian Happ pinch-hits for Lester and draws a walk. 9:54 p.m.: Jon Lester is fired up after striking out Matt Holliday to end the top of the sixth. Nine strikeouts ties Jon Lester’s season high, as well as his career high in the postseason. 9:50 p.m.: Trevor Story doubles to center. He is in scoring position with Holliday, who doubled in his last at-bat, coming up. 9:42 p.m.: End of the fifth inning. That’s nine in a row retired by Freeland. The Cubs go down 1-2-3 again. He has five strikeouts for the game. The Rockies lead 1-0. 9:36 p.m.: Jon Lester retires the Rockies in order. He has eight strikeouts for the game. This one might come down to the back ends of the pen.. Lester and Freeland are rollllling through some tough opposing lineups ? 9:28 p.m.: End of the fourth inning. Kyle Freeland has cruised through four scoreless innings. He has retired the last eight batters in order. The Rockies lead 1-0. 9:20 p.m.: Holliday is left stranded on second after Ian Desmond strikes out out and David Dahl grounds out to Anthony Rizzo to end the top of the fourth. Trevor Story lined out to start the inning. 9:15 p.m.: Matt Holliday is in scoring position after doubling to left. 9:11 p.m.: End of the third inning. Kyle Freeland has a 1-2-3 third inning. The Rockies hang onto their 1-0 lead. 9:05 p.m.: Charlie Blackmon is left stranded on first. Lester strikes out Kyle Freeland and DJ LeMahieu. Nolan Arenado grounds out to end the top of the third inning. 8:53 p.m.: End of the second inning. Freeland retires Willson Contreras and David Bote to end the inning and strand another baserunner. The Rockies lead 1-0. 8:48 p.m.: Daniel Murphy grounds into a fielder’s choice. Almora is out at second. 8:47 p.m.: Albert Almora Jr. starts off the inning with a single to center. 8:42 p.m.: Jon Lester settles down and retires Ian Desmond, David Dahl and Chris Iannetta in order. 8:36 p.m.: End of the first inning. Javier Baez strikes out to end the inning. The Rockies lead 1-0. 8:34 p.m.: After retiring Kris Bryant and Anthony Rizzo, Freeland attempts to pick off Ben Zobrist at first. Zobrist is called out initially, but after further review, the call on the field is overturned and Zobrist is safe at first. 8:25 p.m.: Ben Zobrist comes out swinging. He leads off with a single to center. 8:22 p.m.: Lester gets back-to-back strikeouts from Trevor Story and Matt Holliday to end the top of the first inning. The Cubs will look to even the score. 8:17 p.m.: ROCKIES SCORING PLAY. Colorado strikes first. Nolan Arenado hits a sacrifice fly to center, scoring Blackmon. The Rockies lead 1-0. 8:15 p.m.: DJ LeMahieu doubles to left on a full count. Blackmon is stopped at third. 8:12 p.m.: Jon Lester walks leadoff batter Charlie Blackmon to start the game. 8:10 p.m.: Let’s play ball! 7:30 p.m.: Here are the starting lineups for tonight’s wild-card game.